Jonny Carlson tossed 1.2 innings of scoreless relief during a narrow 3-2 loss to King’s. Missed it … by that much. 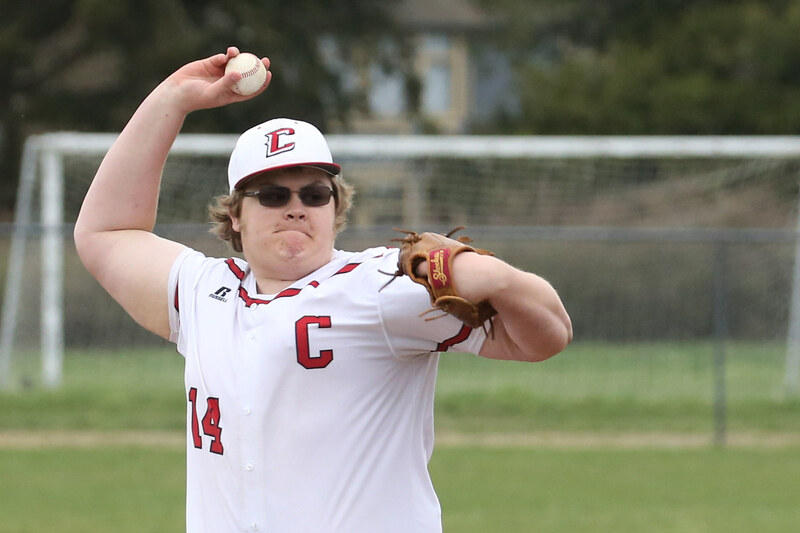 The Coupeville High School baseball squad put King’s on the ropes Wednesday, but couldn’t quite land the knockout punch. The Wolves, who have struggled mightily on offense all season, rallied for two runs in the bottom of the seventh, but stranded the tying run at first base and fell 3-2 to the visiting Knights. 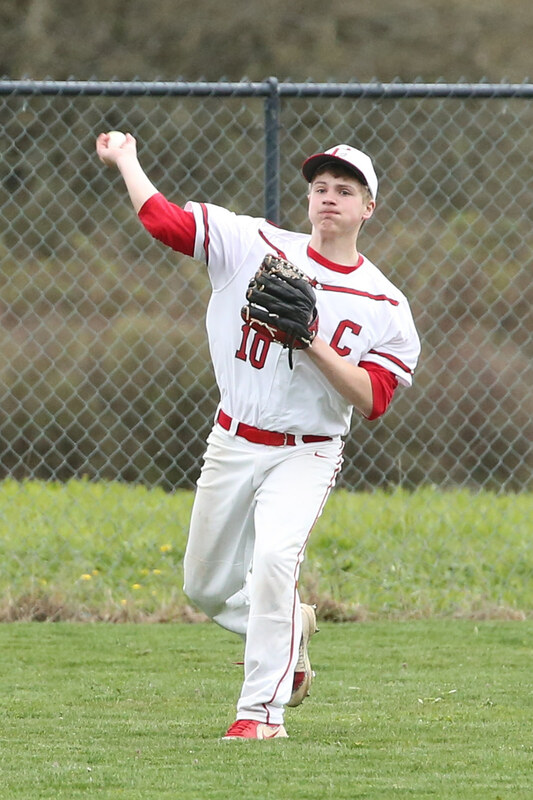 Despite putting together a seven-hit assault, one of its best showings of the season, Coupeville falls to 0-5 in North Sound Conference play, 0-9 overall. That leaves CHS in a tie with Granite Falls (0-5, 2-8), a half-game behind Sultan (0-4, 0-9) for the fourth, and final NSC playoff berth. Cedar Park Christian (8-0, 10-1), South Whidbey (6-1, 9-1), and King’s (3-2, 4-6) hold down the top three slots in a jumbled-up race. While the rebuilding Wolves have been blown out at times this season, they have played the Knights strongly through the first two bouts in their three-game season series. The schools wrap up things Friday in Shoreline, and if Coupeville plays like it did Wednesday, it’s very reasonable to think it could finally break through and nab that elusive first victory. Other than a miscue here or there, the Wolves were solid on their home diamond, with pitchers Dane Lucero, Jonny Carlson, and Cody Roberts teaming to hold King’s largely in check. Coupeville put runners aboard all game, but kept on missing on that one big hit which would have cracked things open. Then they came 99.2% of the way to getting the job done in a wild seventh inning. And it all started with Coupeville down to its final out, and not a base runner in sight. After a strikeout and a little nubber in front of the plate scooped up by an alert King’s catcher, the Wolves looked like they were headed to another shutout. With one out to go, a goose egg would have left Coupeville having scored just eight runs across nine games. But Shane Losey was having none of that. The Wolf senior whacked a liner to left which tore into the outfield grass and shot high in the air, allowing him time to tear round the base-paths and slide into second base in a cloud of dust mixed with reborn hope. Matt Hilborn followed with an infield single, busting a gut to beat the throw by a step, then stole second to set up sophomore slugger Daniel Olson for his spotlight moment. The teen who always hijacked my computer at David’s DVD Den back when he was a kindergartner was ready, poking a ball into the gap between second and first. While the Knights first-baseman got to the ball, no one was covering the bag, allowing Olson to screech into first unimpeded, while both of his veteran teammates came around to score in the madness and confusion. With hard-thumping third-baseman Jake Pease strolling to the plate, popping his muscles and squeezing the life out of his bat, the moment had fairy tale ending written all over it. It wasn’t to be on this day, however, as the King’s shortstop came up with a big play on a hot grounder, going into the hole and popping back up to make the long game-ending throw. While the final score came up just short of what Coupeville was hoping for, the game was a huge step forward for the Wolves. Even when they weren’t scoring in the early innings, they had King’s coaches on edge. The Wolves had base-runners aboard in four of the first six innings, but the Knights dodged danger time and again. It started in the bottom of the first, when back-to-back base-knocks by Pease and Lucero gave CHS a golden two-out opportunity, only to see a ground-out prematurely end things. After going down 1-2-3 in the second and third, the Wolves got a booming two-bagger in the fourth from Lucero, who launched a moon ball which hit just inside the right field line, then skipped merrily away from the charging fielder. But two strong King’s defensive plays later and Coupeville exited with its starting hurler still camped at second. It was a recurring theme, as Bryce Payne and Hilborn walked in the fifth, but were stranded, before Pease singled and Lucero walked in the sixth, only to be denied thanks to a slick double play. While the Wolves came close but couldn’t break through, King’s put two runs on the board in the first and tacked on another in the third. The opening frame especially hurt, as CHS looked ready to escape unscathed. After an opening walk, Lucero bounced back to whiff the next hitter, then Gavin Knoblich nailed a would-be base-thief, the first of two punch-outs by the Wolf catcher. With the bases un-juiced, things were looking peachy, until King’s responded with consecutive base-knocks and took advantage of a throw which sailed over its intended recipient. The third run came via three singles, but the damage was muted when Losey closed the third inning by making a superb snag on a long fly while running full tilt. Lucero kept King’s at bay in the fourth and fifth, before pitch count limits moved him across the diamond to man first base. In his stead, Carlson and Roberts teamed up to deliver another pair of flawless innings. Carlson retired five of the seven hitters he faced, before his freshman teammate came in to end King’s last scoring chance on a bases-loaded strikeout. Coupeville spread its hits among five players, with Lucero (2B, 1B), Pease (1B, 1B), Losey (2B), Olson (1B) and Hilborn (1B) all collecting base-knocks. Payne, Hilborn, and Lucero each walked, with Knoblich, Gavin Straub, Mason Grove, Sage Sharp, and Ulrik Wells all shining on defense. Wells had a super-smooth snag on a liner at first to rob King’s of a hit, while Grove hauled in several long blasts while working way out in the weeds in left.